This photo was taken at Vientiane, the capital city of Laos. 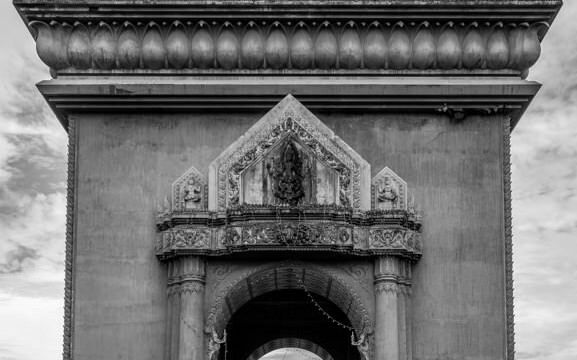 There isn’t much to do in Vientiane and not much to see either aside from the Patuxai War Monument which means the Victory Gate or the Gate of Triumph. This photo was taken in Luang Prabang, Laos. The funeral chapel in the photo is located inside the Wat Xieng Thong (or Temple of the Golden City) grounds. It is one of over twenty structures on the grounds including a sim, shrines, pavilions and residences, in addition to its gardens of various flowers, ornamental shrubs and trees.